Comprehensive. Flexible. Affordable. Almost 1,300 classroom-ready lessons come with extras including PowerPoints, vocabulary puzzles, worksheets, glossaries, prescreened internet links and quizzes. Our daily agriculture news service, AgEd Today, includes a weekly quiz and keeps you up-to-date on agriculture news in the United States and around the world. 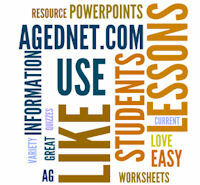 An AgEdNet.com subscription puts all this at your fingertips 24/7.